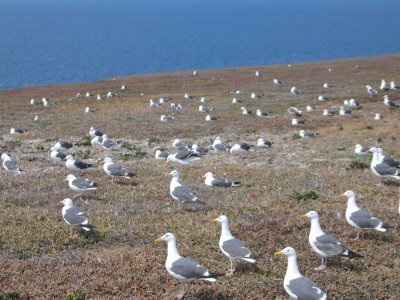 Alfred Hitchcock must have spent time on Anacapa while researching for The Birds. A chain of three almost-connected scrubby islands just off the coast north of Los Angeles, I'd been warned that Anacapa's resident seagulls weren't exactly kiss-kiss sociable. A friend had even recommended that I bring a helmet, but for some reason I hadn't paid heed. Can't countenance the idea of vicious attack birds? Imagine the reaction you'd get strolling through a parents' meeting at a nursery school wearing a sign that reads "child molester." During nesting season, fuzzy gray gull babies plod the treeless ground like the wide-eyed infants they are, while screeching adults menace any and all humans (and try to eat each other's offspring). A quarter mile exploratory walk from my campsite evolved into a shooter game where I was the bonus target. Eerily surrounded and outnumbered by beach-variety seagulls, I'd hear a screech of avian rage and then the dreaded flapping sound. Hovering just overhead, a bloodthirsty beak would unleash a high pitched warrior cry, lunging at my ears. The really angry ones unloaded copious barrages of liquid bird poop, which thankfully missed me as I ran zigzagging back to the tent. Now that you've ripped Anacapa off your must-see list, note that there is a plus side to this island masochism: kayaking. Anacapa's a kayaking dreamland, with cathedral caves to explore and iconic arches to duck through. Massive kelp stalks dozens of feet long trail along the water's surface, tempering the waves. Beefy male sea lions guard caves where their harems sleep, but often a lone sea lion will pop up near your kayak, with big button eyes that will make you forget all about those nasty winged things waiting to menace you on shore. The 6-hour trip from San Francisco to Los Angeles along the I-5 highway can be a straight-shot snoozer, with ho-hum scenery and legions of pokey 18-wheelers blocking the lanes. If you want to learn something interesting during the drive, check out the Invisible-5 audio series. A free downloadable driving tour of the communities near the highway, it's an oral history of some of the region's environmental justice struggles, and an excellent way to get a sense of the geography flying by.